Features Fixed, Two Column, Green, Right Sidebar, Children. 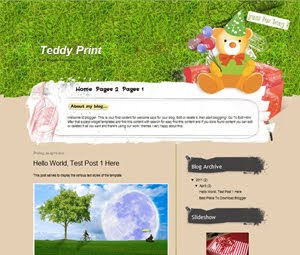 Descriptions Teddy Print is free blogger templates with two column, right sidebar, grass design for header and footer, compatible on all browser is all feature on this blogger templates, very cute themes for your blog. If you likes tedy bear, you must use this themes for your blog.